UPDATE, OCT. 26: The Metro Board of Directors approved launching the formal environmental study process for this project. Under a Board amendment, Metro will also further evaluate the stand-alone grade separations from the technical study as potential project alternatives. Metro will also work closely with the Los Angeles Department of Transportation to further study local intersection impacts. As part of a key Measure M project to improve the Orange Line, Metro staff is recommending building a new one-mile long bridge between Sepulveda and Van Nuys boulevards and installing more than 30 railroad-style crossing gates along the Orange Line between North Hollywood and Chatsworth. 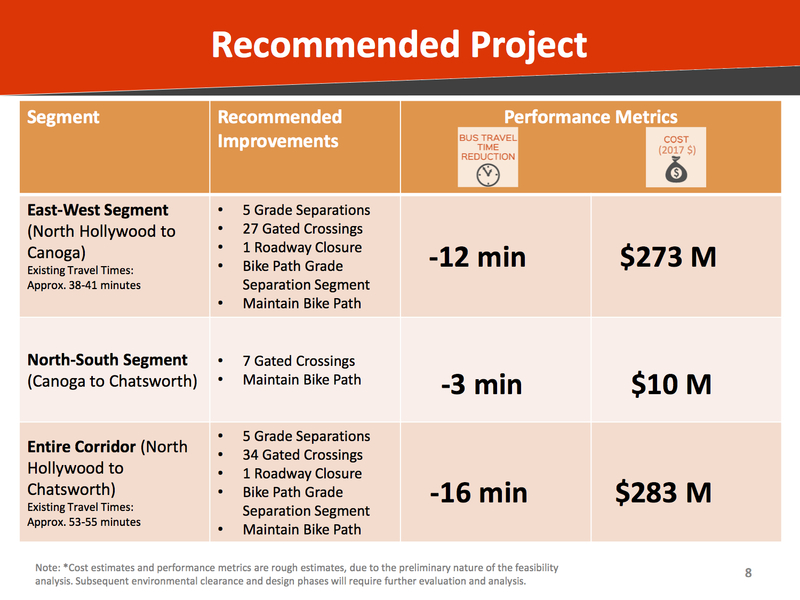 As the chart above shows, the proposed project: 1) Improves travel times — with the ride between NoHo and Canoga dropping from the current 38 minutes to an estimated 25 minutes and times between Chatsworth and NoHo falling from 50 minutes to an estimated 34 minutes, and; 2) Metro has the $283 million to build it from the Measure M sales tax measure approved by county voters last November. The first segment of the Orange Line busway opened in 2005 and was built largely along an old railroad right-of-way. 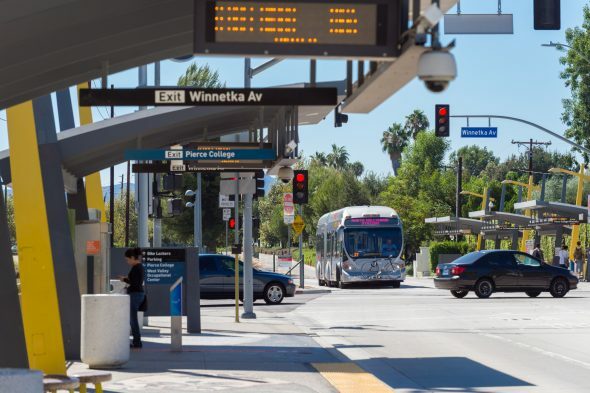 Almost immediately, Metro reduced bus speeds at intersections along the busway to avoid accidents with private vehicles (most involved cars that didn’t stop at red lights). The lower bus speeds threw off the traffic light timing, resulting in more Orange Line buses sitting at red lights. This project would tackle both those issues. The new bridge would eliminate five street crossings and the rest of the street crossings would have ‘four quadrant’ railroad gates that seal off the busway from auto traffic when buses are approaching. The project also proposes to close one minor street crossing — Tyrone Avenue in Van Nuys. •The four quadrant gates would help prepare the Orange Line for conversion to rail. Under the current Measure M spending plan, that isn’t scheduled to happen until the late 2050s. Still, Metro staff views this alternative as the best way to improve current bus travel times, build ridership and prepare for the future. •The bike path along the Orange Line would be preserved. 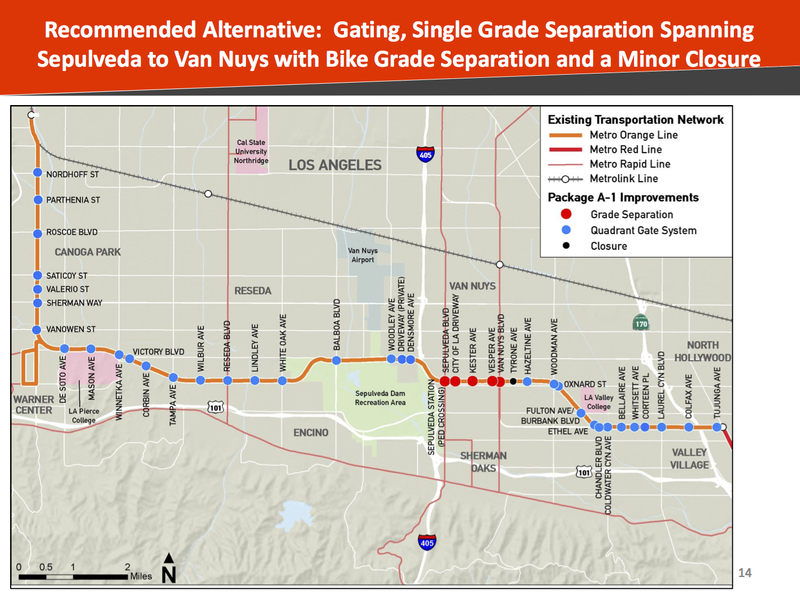 Between Van Nuys and Sepulveda boulevards, the bike path could either run on a single bridge or could run on separate bridges over Van Nuys and Sepulveda boulevards. All other street level crossings for the bike path would remain. •The crossing gates are a way to improve travel speeds while minimally disrupting Orange Line operations. Metro staff will ask the Metro Board of Directors in October to approve beginning environmental review and preliminary engineering of the project. There will also be an extensive public outreach process. The goal is to break ground on the project in 2019 and finish it by 2025. In the meantime, another key project is also in the works: the conversion of the Orange Line to fully electric buses by 2020. More about that in this Source post. “Busway” crossing, I like that, build the crossing gates. Like a train, will the busses sound their horn as they approach the crossing? That would be real neat! I guess that they will have to obey standard railroad signal practice. The signal is two longs, one short, a long, and a bell. Everyone knows the international crossing signal two longs, one short, a long, and a bell. This Is How They know the train is coming through town. Some people do not know the code and there is one signal besides the crossing signal that everyone should know because when you hear it get out of the way 6 Short horn blasts this is the emergency signal hear it get out of the way. Wouldn’t grade separation at Woodman/Oxnard and Fulton/Burbank be more valuable, as they would cross entire intersections with 4 way traffic. Laurel Canyon seems like it would also save a lot of time for a lot of riders. Not sure what the value of grade separating “City of LA Driveway” is. Keep it simple at Sepulveda and Van Nuys and hopefully there is enough money to add a simple separation somewhere east of there. You bring up great points, especially Laurel Canyon needs grade separation. Not sure money needs to be spent to elevate a bike path. I agree…a mile long bridge over a route that is mostly free of cross-traffic seems wasteful. Do we know the cost of this bridge? For the money stated above, it seems like they should be able to: 1. Bridge Sepulveda 2. Bridge Van Nuys Blvd 3. Bridge that horrible double red light Woodman Station 4. Bridge Laurel Cyn. As an regular Orange Line rider, I don’t think that Fulton needs a bridge as that is always a very quick light for the bus. In addition, I am also a bit worried about the Canoga Park area. There are massive housing projects in the works and the streets over there are already starting to get bad. If they could bridge Vanowen and bridge Victory over by Topham, I think that would really help east-west traffic. Keep in mind, both of these streets do not have stations, so the expense would only be the bridge, not a more costly elevated station. Lastly, if money was left over, I would look at bridging some mid-valley streets like Balboa and Reseda. The reason for the single 1-mile bridge is likely because they are building it to Light Rail specifications (limited grade slopes) in anticipation of the future conversion to rail. While the buses on the Orange Line currently could certainly take advantage of multiple, separate bridges, the slope would be too great for traditional light rail vehicles. The trains can handle some up and down — the other benefit is that a single bridge avoids the roller coaster effect of going up and down at frequent intervals. The goal is to get people where they’re going with cookies intact, so to speak! “Boston – C-Commonwealth Avenue streetcar line has a gradient of more than 8%. · Portland – MAX LRT system has a 7% grade on the ramp leading from Second Avenue onto the Steel Bridge. · Little Rock – River Rail streetcar line between Little Rock and North Little Rock climbs a gradient of 7.8% on the approach to the Main St. bridge over the Arkansas River. · San Francisco – grades of 9% on the J-Church and L-Taraval streetcar lines of the Municipal Railway. · Pittsburgh – Route 52-Arlington has a grade of 10%, routinely negotiated by modern Siemens and CAF articulated interurban-type railcars. Steve: Have a look at the Expo line at 405 Freeway…. I’m sure the riders go wee~wee all the way home. I’m not sure I understand your point. Explain please. Maybe….but doesn’t the Expo line have multiple bridges/multiple up/downs? If it works for the Expo Line, shouldn’t it work on the Orange Line as well? The Expo Line does have some bridges, but they are mostly spread apart along 15 miles — and the aerial stretches, especially on the route between Culver City and Santa Monica — tend to stay aerial over several street crossings so there isn’t a lot of roller coaster type ups and downs. Interesting how Chatsworth to Canoga and Canoga to North Hollywood costs 12 million less than Chatsworth to North Hollywood. I think the Canoga to North Hollywood figures don’t include the bike path grade separation. When is Metro going to do something to speed up the Silver Line? They need to charge cars with two people as well during peak periods. A mile long bridge?? Man is that extremely unnecessary. Just build a bridge at intersections (Burbank, Van Nuys, Sepulveda, Reseda) instead. As far as crossing gates go, I’ll take anything over that dumb requirement of slowing down to 20MPH at intersections. Presumably their feasibility study included multiple bridge configurations and this was found to be the most effective. “Just build a bunch of smaller bridges instead” was probably included in that analysis. I’m more curious about the light synchronization – the way this is written makes it sound like an entire decade has gone by since the bus schedule stopped lining up with the light timing, and they’ve done nothing to change that until now. I suspect the mile-long bridge makes sense when you see it as a big step toward converting the corridor to rail. As a daily rider on the Orange Line, I appreciate these – especially the Grade Separation. That will probably help not only the Orange Line but also traffic on Sepulveda and Van Nuys. I know there’s a lot of chatter about converting to light rail – mainly for increased capacity – but all I care about is how frequent the Orange Line is, particularly at peak times. Having a new bus come every 3 minutes is the most important aspect to me after the speed of the ride itself. Finally, I find the slowest/longest light tends to be the very last one when coming into Van Nuys. I’ve missed many a tight connection simply because that last light is so long! I think the most important thing about the OL is the consistancy of speed. Some drivers can get from Balboa to Noho in about 15 minutes. Others can take up to a half hour. It is very fustrating when you have a bus driver who is going so slow. Maybe the ones which drive fast are at their end of their shift. If the buses just travel at a faster speed, like at 50 mph, it can make the whole line better. Overall this looks like a very good, relatively cost-effective step for the line. I worry that the devil will be in the details regarding how the spaces are underneath the structure. I think it’s important to look at making the space under the bridge/ramps great for bikes and peds – stuff like allowing bikes to cross at Tyrone, and perhaps elsewhere. It would be good to activate the space underneath… though probably without any permanent buildings, so maybe (in collaboration with community input) things like relatively low cost mini-park tot-lots,basketball courts, skate parks, food trucks? Steve, how would the Van Nuys to Sepulveda bridge impact the businesses just to the North and South of the busway? Would the bridge(s) be able to be built on the existing Metro property? Those are good questions. Answer: I don’t know at this moment. There should be a staff report on the issue that will be published later this month and there will be environmental review of the project that will look at its impacts. The Metro Board is being asked by staff to start that process. It should be going to the Board this month. As for the route/property issue, the map indicates the bridge would follow the current Orange Line right-of-way. I’ll post anything that comes out as soon as it’s published! It’s obvious that the grade separation is for the anticipated East SFV Transit corridor. You can’t have the orange line in the path of the trains. Choose site D at 7600 Tyrone and save the taxpayers hundreds of millions of wasted money to acquire 29 acres of vital manufacturing. Site D is currently owned by LADWP the site has been vacant since 1962. It’s ready for immediate construction and would not uproot close to 200 businesses that employ over 1000 people. This site if acquired with the parcel next door 30 acres can be shared with LADWP and they can both have a huge piece of cake and set an example of how public projects can benefit the public. The more I look at this project the more I think that is is being done with the lobbyist and a few powerful corporate entities that will stand to make a fortune. @ Joe Linton it’s a pipe dream. The only thing living under the bridge will be a fenced off train MSF . and no bicycle lanes if the light rail is realized. You will have to bike on Kester or Hazeltine. The devil is in the details not angels as you posted on your blog. Why can’t the buses have priority over light signals? that would speed them up. Also, I see many near miss accidents caused by drivers running lights. Why are cameras only at certain crossings? Seems wealthier neighborhoods don’t have to have cameras. guys… this is better than nothing but its also a bit short. why a mile long bridge? ok van nuys and Sepulveda are busy but everything in-between isnt so why is that bridged? oxnard and wodman intersections are a mess! reseda is horrible! balboa and woodly HORRIBLE! really? grrr… can the people that plan or suggest these things PLEASE RIDE THE LINE!!! PLEAASE JUST TAKE A MOMENT AND RIDE IT DURING THE WORST TIMES! its getting really frustrating!